It’s rare for theater to journey along rugged terrain on stage. The “living room play” has always been a theatrical favorite so when a play goes to the great outdoors, it’s a treat. 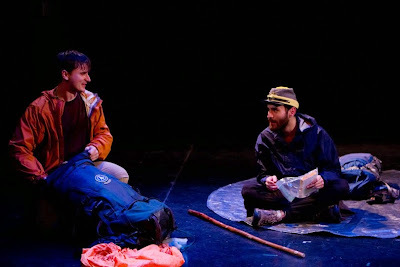 But when a play not only ventures to the woods but attempts to tackle a nearly 2,180 mile adventure, it’s something unique. In Brenton Lengle’s North to Maine, we watch a group of hikers take on the sometimes-treacherous Appalachian Trail while dealing with the elements, the past, and each other. North to Maine follows newbie hiker Adam as he sets forth to tackle a trail only some have finished. Along the way he encounters four very different personalities, some with trail names, who accompany and help him on his quest. Adam, like his trail namesake Frodo, is on an epic journey to prove his worth. North to Maine is an engaging look at the lives of through hikers of the Appalachian trail. The trials and tribulations that these people endure in order to reach their peak is invigorating. Like the trail, Lengle’s play is long with moments of tough terrain. Many of the scenes go on longer than they need to, weakening the stakes of the moments of absolute rest. But when the moments are earned, they are quite beautiful. Though the script is filled with hiker lingo, as you journey on, you begin to feel a part of their world. With a variety of clashing personalities, many of the characters, with the exception of Creature Man, serve as foils for Adam rather than complete, well rounded characters. Though a two-hander would not be as interesting, the relationship arc between Adam and Creature Man is quite captivating. As journeyman Adam, Tim Dowd has a lot of weight to carry in this piece. Dowd has the youthful quality to his character, but lacks levels. He seemed to make every woe a big deal. Adam La Faci as Creature Man brings a unique presence to the trail. His story is strong and his chemistry with Adam are some of the best moments in the show. La Faci has an overall intensity as Creature Man that needed to be lessened to land the more sentimental moments. Director Eric Parness brings a great vision to the piece. He is able to avoid monotony with the simplicity of the space. While evoking the atmosphere of the trail could have been taken even further, what he presented was grand. North to Maine is a diamond in the rough. It’s a piece that has great potential that deserves a larger audience. If the spirit of the trail can be explored further with fluff removed, North to Maine can be something special.